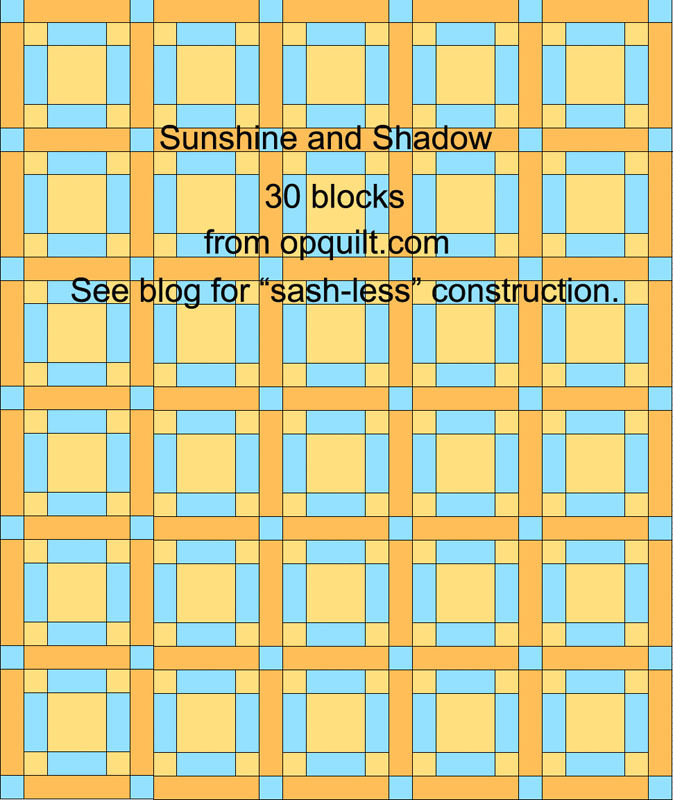 Sunshine and Shadow Quilt Tutorial | OccasionalPiece--Quilt! 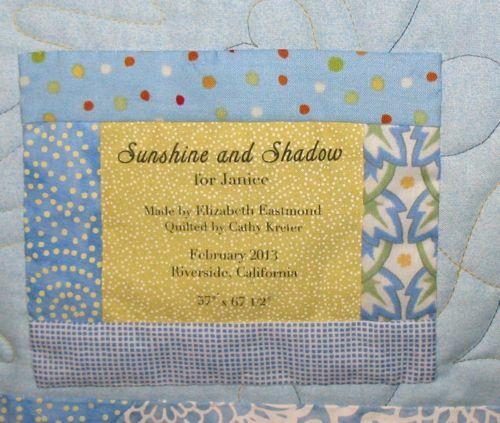 Posted on February 14, 2013 by Elizabeth E.
Here’s the recipe for the quilt I gave to my sister-in-law, Janice. But I think you’ll notice how “lopsided” the block is–and that’s because I wanted to eliminate the sashing step, including it in the making of the quilt. I also wanted to make this quilt completely from my fabric stash, so I chose colors I had multiples of, in different designs and shadings. What is sashing? It’s those long strips that separate blocks from each other and can be part of the design of a quilt, letting each block float in its own little world. Many modern quilts eliminate them, but I like them occasionally. 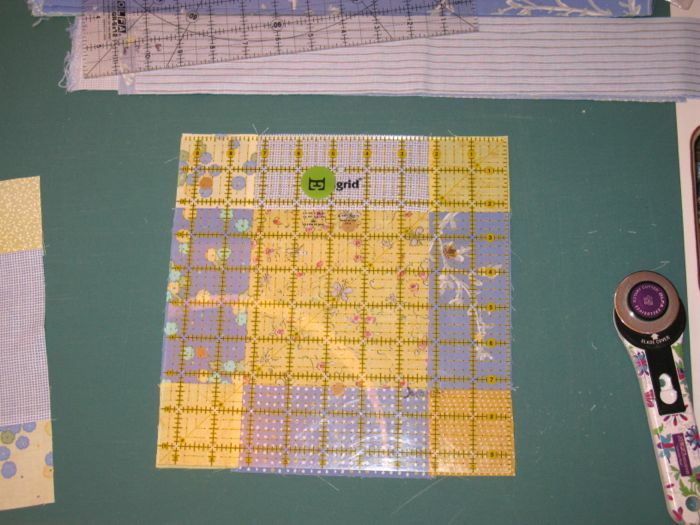 I started with the centers and cut all of them from the same line, but used two versions of the yellow flowers. 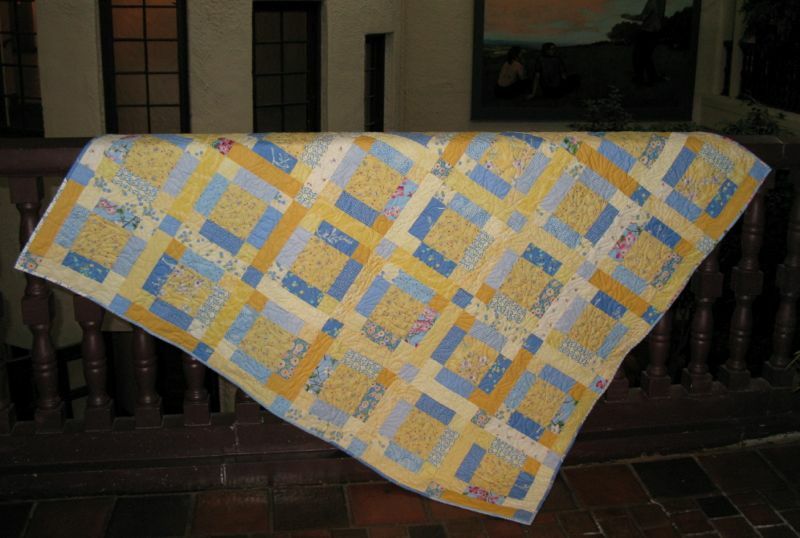 Then I pulled out a lot of different fabrics, trying to keep in the same tonality in the blues, and in the yellows, so the quilt top would be harmonious. 1. After cutting, the first step is to sew two blue strips on the sides of the large center block. 2. 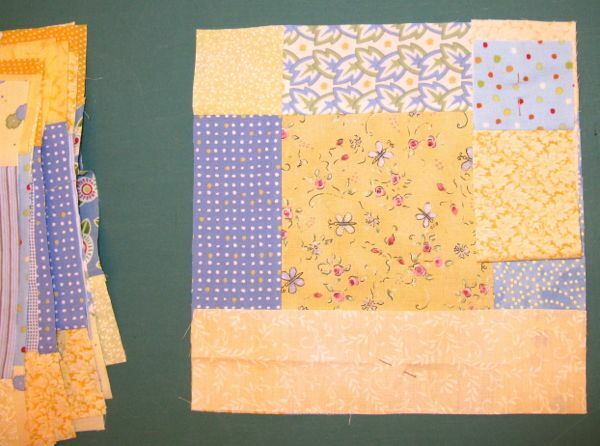 Sew two yellow blocks on the end of the blue rectangles. 3. Line them up. 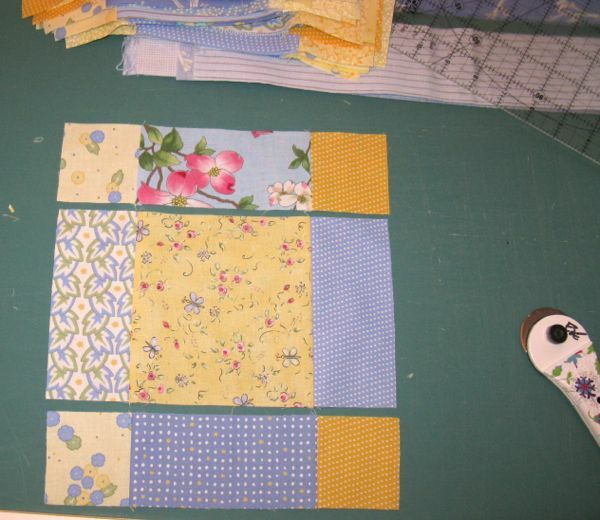 After choosing good sets that go well together, stitch the yellow square/blue strip pieces onto the center. I pressed the seams towards the blue, away from the yellows. Sew the strips onto the center section. 4. True up, by placing a 9 1/2″ ruler on top. I found if I trued it up at this stage, the rest of the construction went smoothly. 5. 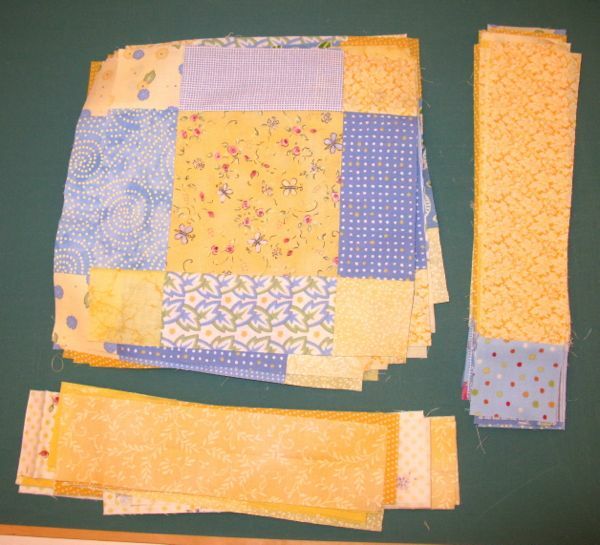 Sew all but one of the blue squares onto the larger yellow strips. Then get ready to put them all together. You won’t use all the blue square/yellow strip pieces at this point. Just set the extras aside. 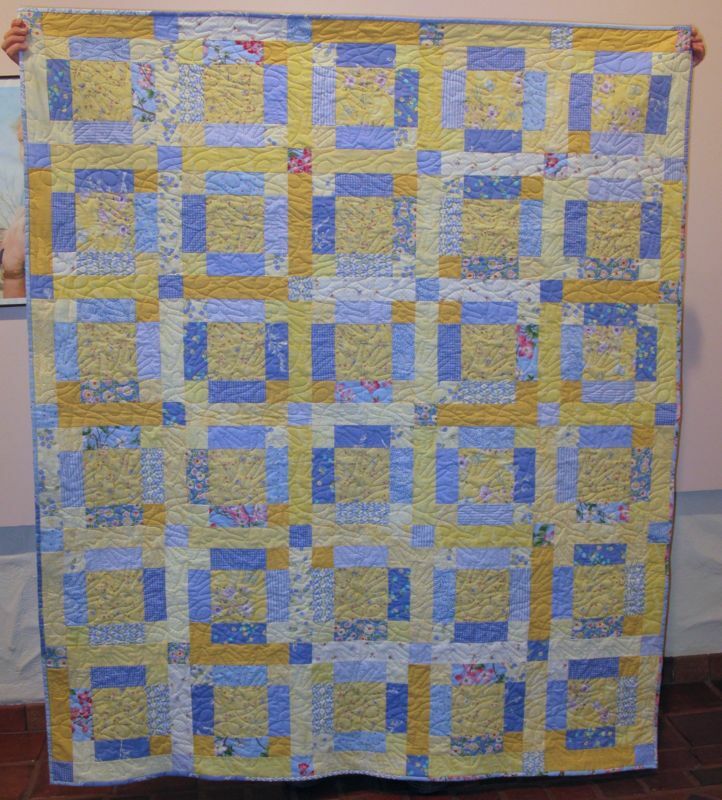 I wanted to audition how the random yellows and blue fit together, so I took one large block, a yellow strip and a blue square/yellow strip piece, making sure I wasn’t duplicating fabrics in any significant way. 6. I pinned the yellow strip on the bottom, and folded up the other strip and pinned it to where it would eventually be sewn. Sew on the yellow strip. Here it is, with yellow strip sewn on, showing that I pressed the seam to the outside yellow. In all cases, first press seam flat to eliminate puckers, wobbly edges, then press the seam open. 7. 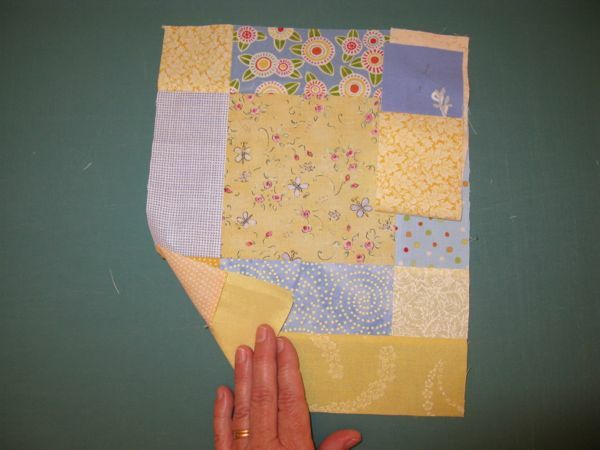 Sew the blue square/yellow strip piece on the center construction, matching seams, etc. This is the finished block. 8. Because my pin wall is longer from side to side, than from top to bottom, I rotated the blocks a half turn and laid them out on the wall. I kept using my digital camera to make sure that there weren’t too many of those darker yellow-gold pieces mushed together, as well as eyeballing a good distribution of the rest of the colors. The quilt looks a bit strange now, because you are still missing a length of “sashing” on the left side and on the bottom. 9. Because I still wanted to sew these as blocks, I laid out the “sashing” pieces, each with a blue square on them, where they should go. I laid them out, again checking for color and value distribution. 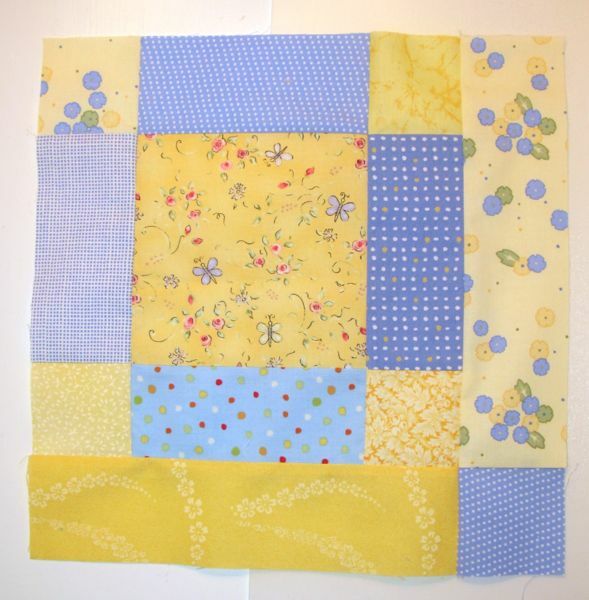 I had to sew that random last blue square onto a yellow strip/blue square piece, then I sewed these pieces onto the adjacent block. When you replace these new expanded blocks on your pin wall, be careful not to rotate them into a wrong orientation. Use your last digital photo as a guide. 10. 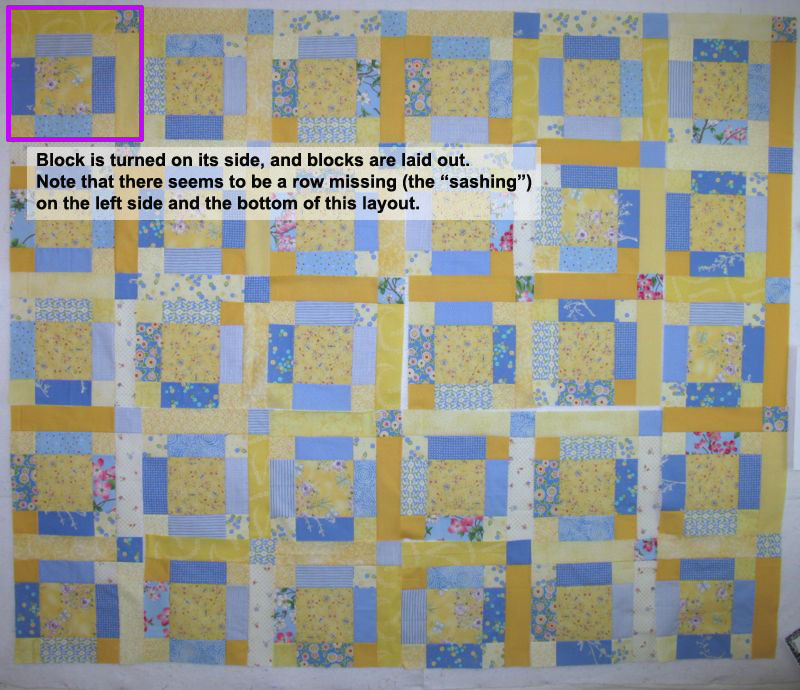 Put quilt together: I put row markers (shown in *this post*) on the blocks on the left side of the wall, in order to keep track. Then I stitched the rows together, going across. Stitch rows together, going down, until the quilt top is complete. I think it goes much faster (have I said this before?) because you are sewing blocks, rather than long strips of sashing. Quilt as desired (and my favorite way is calling Cathy and having her do it for me). I used the extra bits of blue strips I’d cut out, plus extra, to make a scrappy binding. To make the label, I did the usual method of pressing some fabric to freezer paper, running it through my Epson printer (they have the best inks), bordering it, then stitching it onto the quilt invisibly around the outside edges. I also like to do it on the inside edge of the border, where the label meets the edging. No one can tell, but it poofs out less from the surface of the quilt if it has that second round of stitching. I’m actually planning to make another like this, as it is really quick, and I like the fact that I can use up my stash. I seem to have lost a few days here, but with the weekend coming (a holiday weekend! 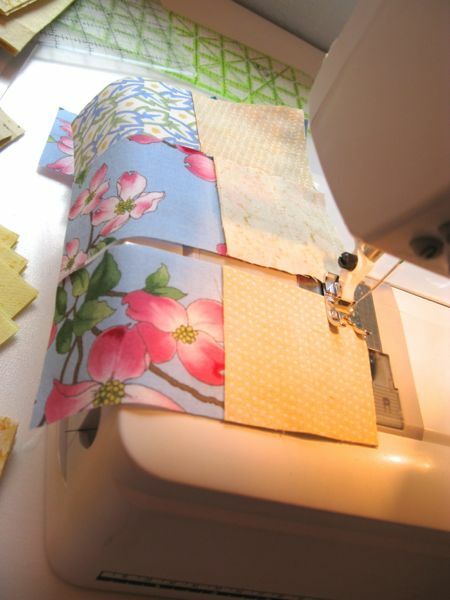 ), I hope to find time to dive into some stitching, and some blogging. Very nice, thanks for sharing the techniques and pattern. I like the way you put this together. I really don’t do sashing or borders much. In this design your sashing creates a lovely secondary pattern with a little block in each corner. This pattern would look so different if it were coloured different ways. 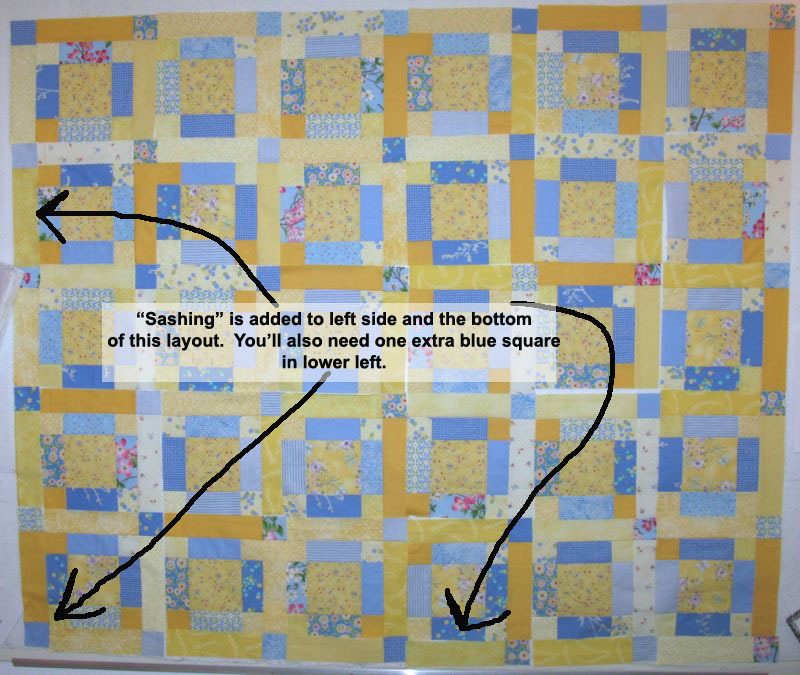 Thanks for sharing the tutorial for how you made your sister-in-law’s quilt. It’s such a beautiful quilt. Pingback: Another Sashless Quilt | OccasionalPiece--Quilt! 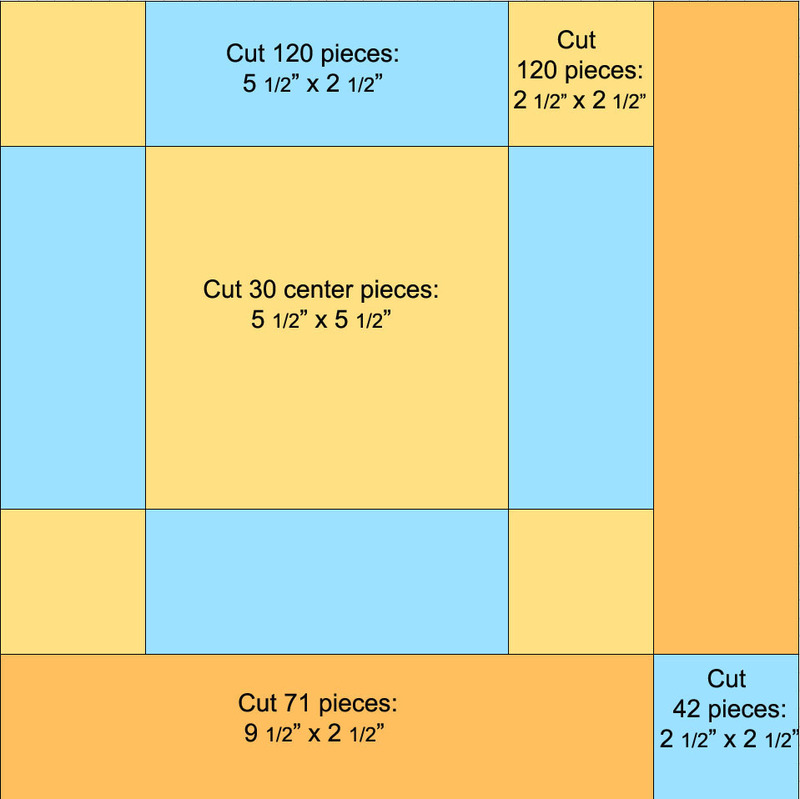 Pingback: Chris’ Welcome-to-the-Family Quilt | OccasionalPiece--Quilt!